The Public Data Lab in collaboration with the Digital Methods Initiative is holding a data sprint on fake news in the age of social media. The sprint consists of hands-on work to research the making, circulation, responses and controversies associated with fake news, together with a day of talks by prominent researchers in the area. The data sprint is part of a Public Data Lab project to develop a field guide to fake news in US and European politics. Research developed during this sprint will contribute towards the field guide, as well as an edited volume on the topic. 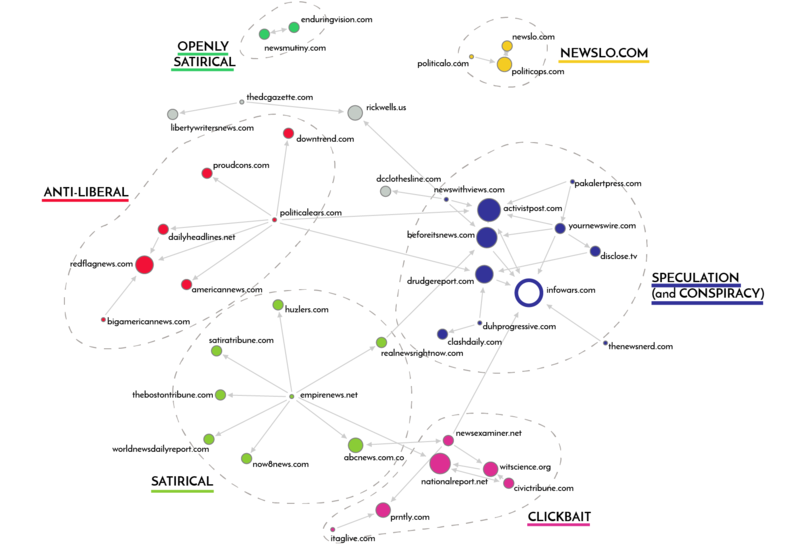 In the wake of concerns about the role of “fake news” in relation to the election of Donald Trump in the US, this project aims to catalyse collaborations between leading digital media researchers, data journalists and civil society organisations in order to map the making, circulation, responses and controversies associated with misinformation online in US and European politics. In the first instance collaboration is organised around series of online activities and in-person data sprints leading to a series of data stories, accompanied by a field guide with a comparative set of graphics and findings. These will be published ahead of several upcoming European elections and political events. The guide is planned to be launched at the International Journalism Festival in Perugia in April 2017. To generate materials to inform innovative and data-rich media coverage of these phenomena in the US as well as European countries. An edited volume on the topic. The project is run by the Public Data Lab with support from the First Draft Coalition. The Digital Methods Initiative is dedicated to reworking method for Internet-related research. The Digital Methods Initiative holds annual Digital Methods Winter and Summer Schools, which are intensive, week-long undertakings in the winter and summertime. The coordinators of the Digital Methods Initiative are Dr. Sabine Niederer and Dr. Esther Weltevrede, and the director is Professor Richard Rogers, Chair of New Media & Digital Culture, University of Amsterdam. The Digital Methods Initiative is online at http://www.digitalmethods.net/. The DMI ‘about’ page includes a substantive introduction, and also a list of members of the Digital Methods Initiative, with short bios. DMI holds occasional Autumn and Spring workshops, such as ones on mapping climate change and vulnerability indexes as well as on studying right-wing extremism and populism online. On the website there are also a Digital Methods book by Richard Rogers (MIT Press, 2015), papers and articles by DMI researchers as well as DMI tools. For further questions please email contact at publicdatalab dot org.